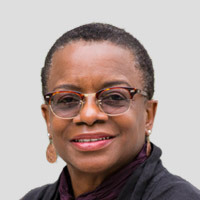 Kathleen McElroy is the director of the School of Journalism and a professor at The University of Texas at Austin. She received her Ph.D. from the School of Journalism in December 2014, after nearly 30 years as a professional journalist. At The New York Times, she held various management positions, including associate managing editor, dining editor, deputy sports editor and deputy editor of the website. She previously worked for The National, an all-sports daily and Newsday on Long Island as well as the Austin American-Statesman, The Huntsville Item and the Bryan-College Station Eagle in Texas.